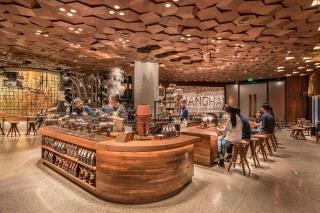 (Newser) – Shanghai now boasts the biggest Starbucks in the world—an upmarket "Reserve Roastery" that, at 30,000 square feet, is more than 40 times bigger than the average apartment in the city. The establishment is the first Reserve Roastery outside the US, and it's almost twice as big as the previous record holder, a Roastery that opened in Seattle in 2014, CNN reports. China is now Starbucks' second-biggest market, with around 3,000 outlets across the country, about 10% of the world's total. Howard Schultz, the chain's executive chairman, says the new store will blend Starbucks' expertise with China's "rich, diverse culture." He'll lose his shirt there. After greasing party officials and hiring a Chinese national to act as the owner of record, it won't leave a lot of profit. "with China's rich, diverse culture" Since when? I thought they were all Asian of one flavor or another. LOL!